British Prime Minister David Cameron wants to prevent suspected rioters from using social networking sites to organize criminal activity. In his opening statement to Parliament, Cameron questioned the role of social networking sites such as Twitter and Facebook in the spate of recent riots that have spread throughout England. "Everyone watching these horrific actions will be struck by how they were organised via social media," said Cameron. "Free flow of information can be used for good. But it can also be used for ill." He then added, "Police were facing a new circumstance where rioters were using the BlackBerry Messenger service, a closed network, to organise riots. We've got to examine that and work out how to get ahead of them." "And when people are using social media for violence we need to stop them," he said. "So we are working with the police, the intelligence services and industry to look at whether it would be right to stop people communicating via these websites and services when we know they are plotting violence, disorder and criminality." Cameron also vowed to do "whatever it takes" to restore order, a statement that, in this context, has free speech advocates worried. Jim Killock, executive director the Open Rights Group, an online free-speech advocacy group, believes that censoring "suspected" rioters without the input the court system could be construed as an attack on free speech. "How do people 'know' when someone is planning to riot?" he said. "Who makes that judgment? The only realistic answer is the courts must judge. If court procedures are not used, then we will quickly see abuses by private companies and police." He then added, "Events like the recent riots are frequently used to attack civil liberties. Policing should be targeted at actual offenders, with the proper protection of the courts." The police have made numerous arrests based on evidence gathered from Facebook, where various criminal masterminds have taken to posting pictures of themselves with items stolen during the riots. Home secretary Theresa May will be holding meetings with execs from Facebook and Twitter in the coming weeks. 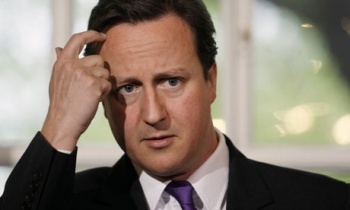 In the meantime, Cameron has urged Facebook and Twitter to remove messages, images and videos that could incite unrest. "All of them should think about their responsibility," he said. He also suggested that media outlets should give any unused footage of the riots to the police to help in making arrests.